If you asked me a week ago when I last moved house I could have happily said 12 years ago. If you ask me now, I can say 3 days ago. My lack of experience on such matters became apparent on the day, not quite planning on where I wanted large items put by the movers, etc. More significantly though, hanging on to the kettle so we could make tea, and then completely forgetting to keep some mugs back too. I’ve also lost the cutlery, I say lost, it is in a box somewhere, but we had to buy some emergency £1.99 knives and forks. 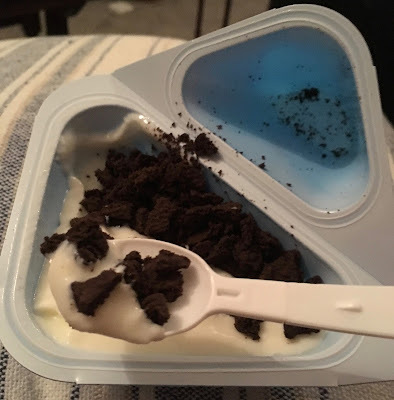 So when we did an emergency shop in Morrisons to pick up other missing essentials, think washing up liquid and sponges, I also spotted these Oreo yoghurts, complete with a plastic spoon in the lid I thought huzzah! You probably were trying to work out where I was going with this moving rant. Anyway I've had about 4 hours sleep three nights in the row, so I’m a little off the ball, but I hastily put these Oreo Yoghurts in my basket and thought I’d blog about them, after all they are clearly labelled “New”, and they looked new to sleepy me. When I got home and tried one after our takeaway, I peeled back the lid to reveal the handy spoon. I then looked at the yoghurt and thought is looked familiar. 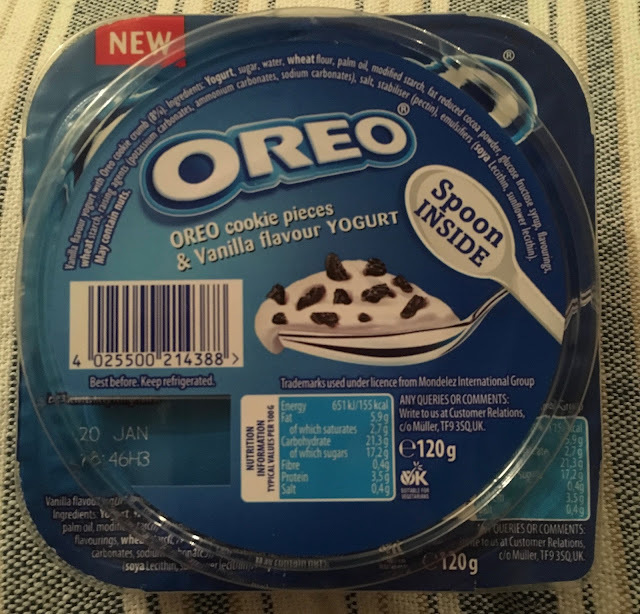 I did a search here on Foodstuff Finds, and it looked almost identical to some we reviewed in Feb 2017; “New Oreo Corner Yoghurt”. 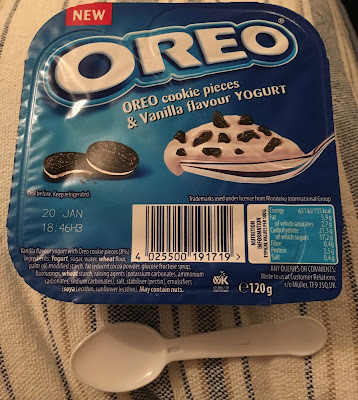 Having said that it had a lovely cool vanilla and lightly sweet yogurt section, and some softer biscuits pieces that tasted distinctively of Oreo. I do love Oreos. I enjoyed every bit of these yoghurts, and the contrast in flavour of the two sides. 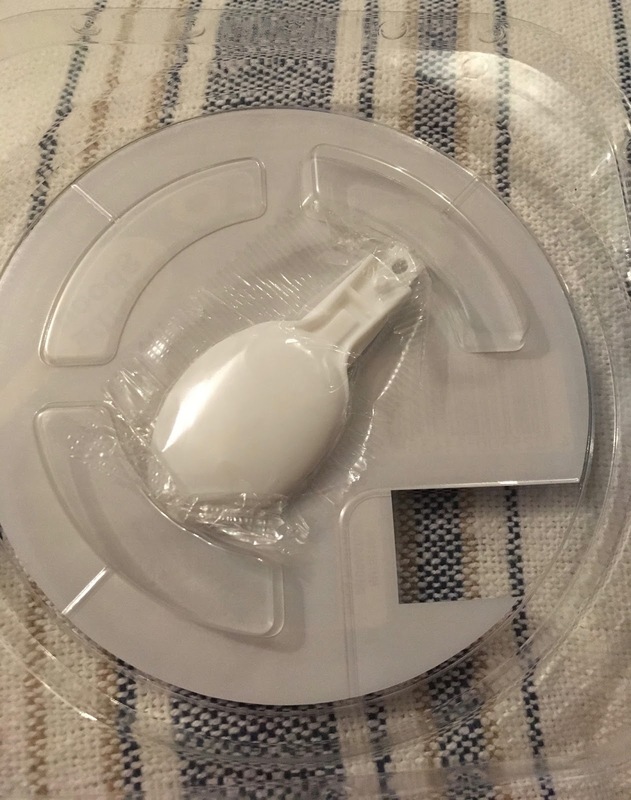 So in summary this wasn’t very “new” except for the spoon part, which turned out to be perfect after a house move, so the moral is don’t always trust those “new” labels.